We’re leaving Chennai today and driving to Bangalore which is around a 7 hour drive. Vivek has a couple of work meetings lined up there so hence the reason for the trip. Vidya’s family is from Bangalore so she’s taking a few days off work and making it a 5 day weekend. Thursday, October 2 is Gandhi’s birthday and a national holiday. It’s a dry holiday too which means no drinking is allowed. Isn’t that the whole point of having holidays so you can day drink on a week day? 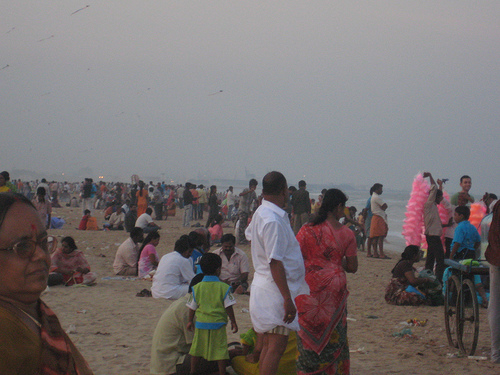 The Rough Guide to India (yes, I’ve converted from Lonely Planet) says there isn’t much to see in Chennai and that most people just use it as a travel hub to get somewhere else. At Marina Beach. Can you find me? Before arriving here I figured I’d prove them wrong and find a way to enjoy it here. But after 4 days I can say I’m not too torn up about leaving. There’s just nothing to do. Usually no matter where I go I like to explore the city by walking around and just seeing where I end up. The problem here is I don’t want to walk around. The day time temp is a sticky, humid 100+ F. There are no sidewalks to walk on so you’re basically walking in the street with cars and scooters riding 5 wide in a 2 lane road, and on top of that you’ve got these stray dogs eyeing you wherever you go. And there’s no where to walk to, like a park, or something, anything touristy. And there is trash all over the place, in the bushes, on the side of the road, everywhere. There is minimal infrastructure here. There are no public trash cans since there is no city trash pick up, only residential trash pick up. I get the sense that people are not motivated to be proactive in improving their neighborhood because there is just so much to do. It’s overwhelming. And people don’t seem to expect miracles from their government anytime soon as corruption is ingrained in the politics here. For example, in a recent election, in order to get more votes, one of the parties released 1,400 convicts from prison who had been serving life sentences. Just so they could get their votes. And most of these guys were then hired to be part of what is known as the ‘intimidation network’. Think of the strong arm guys doing the dirty work for the Mafia. Another perhaps more humorous example is in another election one of the parties promised televisions to anyone who voted for them! They supposedly gave out 10 million tv’s! I should have asked if they won. Vivek and Vidya’s house cleaner said she went this route but is still waiting for her tv and no longer expects to receive it. But she did get a silver bowl which is given out to people who convert to Christianity. No kidding. Local priests over here are on a bonus payment structure where the more people they can sign up, the more money they get. And the people paying them are churches from other countries. This is nuts! I’ve seen at least a handful of good sized churches in my few days here. But given all that, I’m glad and very thankful to have started my trip here. It’s been great having a comfortable home to help get acclimated in my first week. I got super-congested my second day here from the allergies and a/c and humidity and I couldn’t imagine having had to deal with all that in a dinky hotel room somewhere. And it made for a great trip to the pharmacy, if you can call it that. 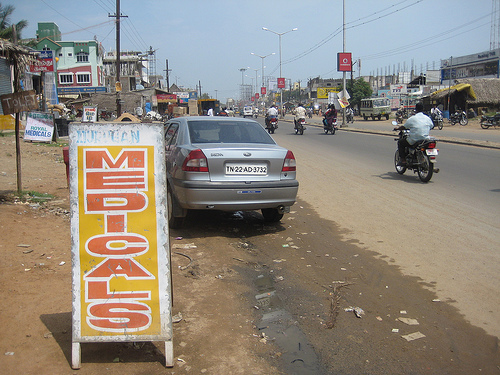 It’s basically a road side shop with a ‘Medicals’ sign posted in the dirt. And where the ‘pharmacist’ opens up a shoebox and starts shuffling through it to find my allergy medicine. But it’s way cheap. $1 for a whole bunch of pills that would have been over $20 at least back home. Recoveries aside, I’ve looked forward to every dinner Vidya has made. Last night she finally had enough of me telling her to make the food more spicy, that I could handle it. And wow was it spicy. But I think I handled it better than Vivek who kept going back for more yogurt to cool off. So there you have it. I’m leaving the land of free tv’s and silver bowls. I really should probably wait around for the next election and stock up on those essentials but I’ve got a ride to Bangalore that I need to take.